In 1999, the Bear Creek Nature Preserve was created and set aside in Bear Creek Canyon at Casitas de Gila Guesthouses. Initially comprising some 70 acres, the Reserve was gradually enlarged to 265 acres. Six miles of maintained hiking trails along three-quarters of a mile of Bear Creek Canyon allow Casita guests to explore the diverse habitats that exist along and adjacent to Bear Creek. Over the past 15 years, the Nature Preserve has been an on-going source of pleasure and delight for both guests and hosts alike, allowing them to observe the various cycles of natural change that have evolved along this stretch of Bear Creek. Initially this segment of the Bear Creek Canyon consisted of an over-grazed, straight channeled, gravel and debris choked and scoured floodplain, essentially barren of any vegetation over six feet in height, bordered by thousand-year-old mature-growth vegetated river terraces on both sides of the floodplain. 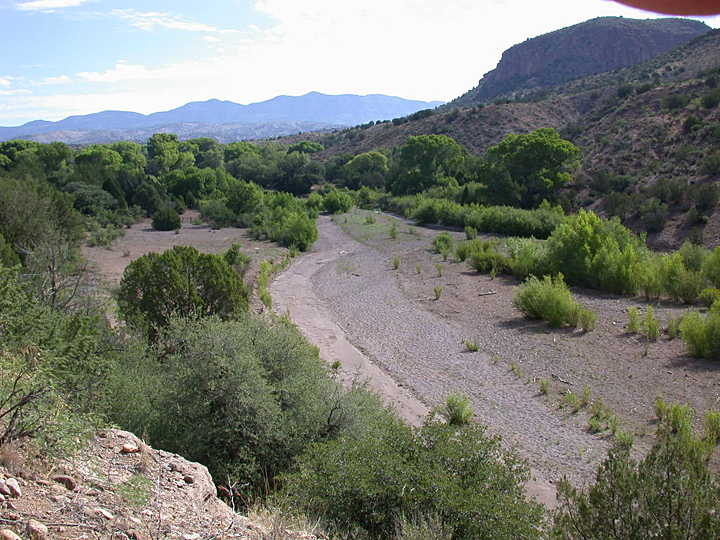 These stream terraces, once farmed by the ancient Mogollon Pueblo Culture, were being actively eroded and cut away with every succeeding flood that came down Bear Creek. 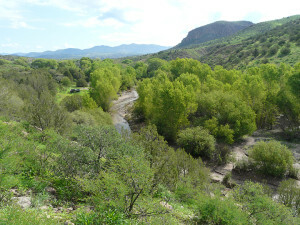 With fencing and removal of the cattle that had overgrazed the floodplain for many years, the young Cottonwood, Willow, Sycamore, and Seep Willow were able to take root, grow, and stabilize the eroding creek banks and immediately began to reestablish the natural riverine forest in the floodplain. Today, the creek bottom within the Nature Preserve is unrecognizable from its former state 15 years ago. The vegetation over the floodplain has evolved and matured into a diverse riverine forest dominated by stands of 30- to 80-foot young cottonwoods, sycamores, and willows that border a now meandering creek and have stabilized the formerly eroding old stream terraces. 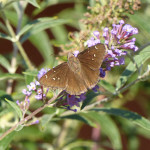 A complex vegetative diversity of trees, shrubs, and flowering weeds and grasses now abounds over the floodplain and adjacent terraces, providing year-round habitat and food for an equally diverse assemblage of animals, birds, and insects. 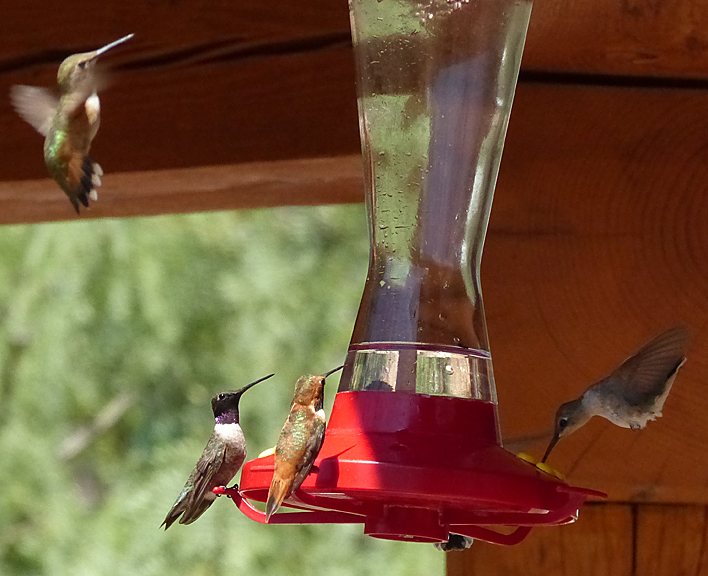 For 16 years now, guests at Casitas de Gila Guesthouses have been treated to the spectacular annual gathering of hummingbirds that takes place between their arrival in late March until their departure in early October. 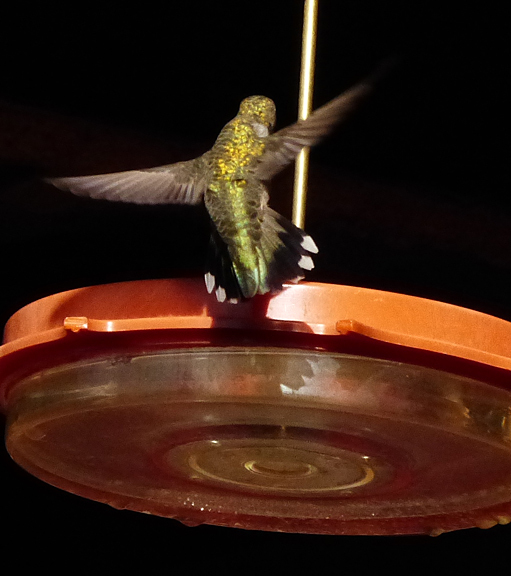 Initially the number of hummingbirds who decided to visit during the “Season” at the Casitas was modest, but over the years the number has grown exponentially, as evidenced by the volume of sugar water nectar consumed by the voracious slurpings of these amazing little creatures! This year, for example, the Casitas will use approximately 150 pounds of granulated sugar to make the 85 gallons of nectar that will be consumed over the roughly 200-day season. There are some 325 to 340 different species of Hummingbirds in the World (depending on who is counting), all of which are found in North, Central and South America. Twenty-seven species of of these hummingbirds have been reported in the United States, and 17 are reported in the State of New Mexico. 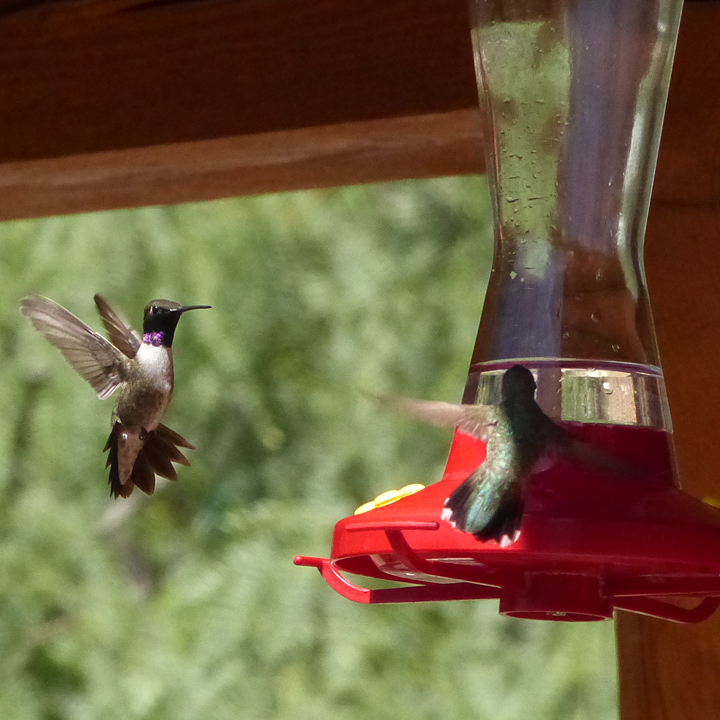 Here in Southwest New Mexico, there are 7 species of hummingbirds reported from the Gila National Forest (bird checklist available for download as .pdf file), 5 of which visit the Casitas over the course of the Summer. 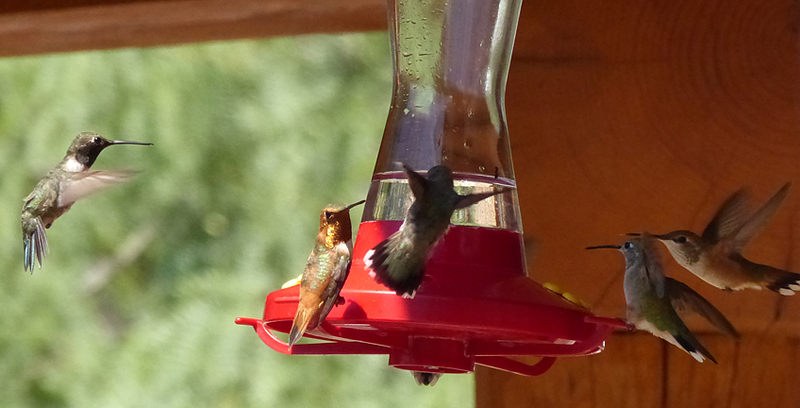 Most abundant, first to arrive, and last to leave are the Black-chinned Hummingbirds (Archilochus alexandri). 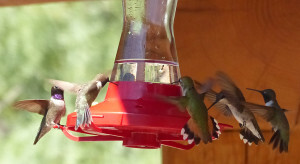 The Broad-tail Hummingbird (Selasphorus platycercus) is also a common visitor. The Rufous Hummingbird (Selasphorus rufus) comes in late Summer, arriving in July and peaking in August. The Calliope Hummingbird (Selasphorus calliope) and the Magnificent Hummingbird (Eugenes fulgens) are much less common, occasionally seen in August and early September. 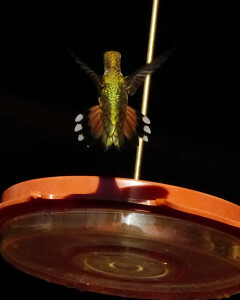 Hummingbirds are the smallest birds in the world, and weigh between from 0.07 to 0.7 oz. (2 to 20 grams). In their research on hummingbird foods and feeding, Hainsworth and Wolf have shown that Ruby-throat Hummingbirds can consume up to 14 times their weight in sugar water from artificial feeders in a single day when filled with the typical 1:4 concentration of table sugar and water! They also found that the sugar concentration in wildflowers could be up to 8 times greater than the typical 1:4 sugar water concentration. 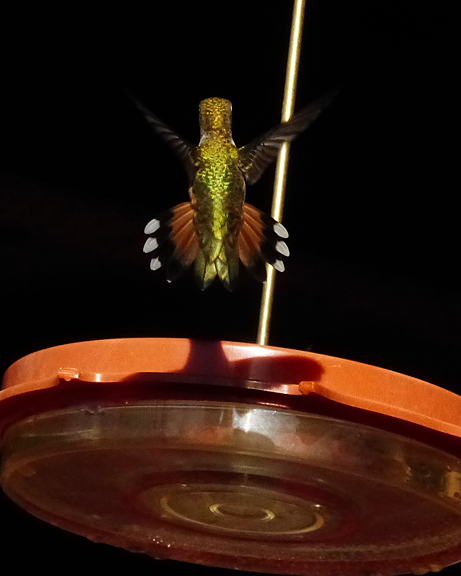 Since hummingbirds at the Casitas have access to both artificial feeders and wildflowers, the average hummingbird at the Casitas probably consumes at least several times its weight in nectar in the form of many small meals slurped up from the Casita feeders. 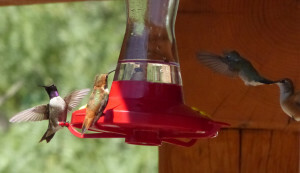 In addition, the hummingbirds will also consume a sizeable daily intake of small insects and spiders that provide the essential proteins, amino acids, vitamins, and minerals that flower nectar and sugar water nectar do not contain. 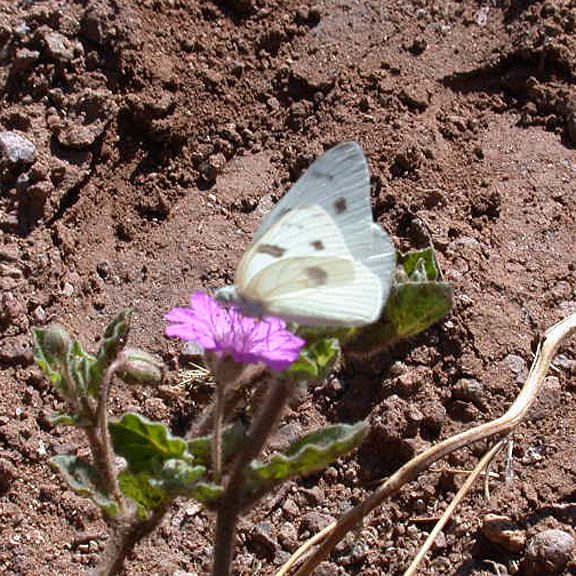 Some of these insects they find around the Casitas, but most are caught during numerous forays into the riparian forest along Bear Creek, 100 feet below the Casitas. 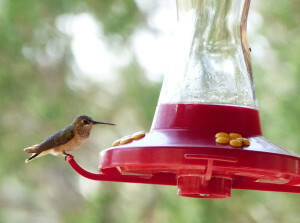 A primary attraction for the large number of hummingbirds that visit the Casitas is the presence of the extensive riverine forest of the Bear Creek Nature Preserve along Bear Creek, where a profusion of wildflowers and small insects are found during the Summer months. Breakfast finished, Mrs. Black-chinned quickly flits to her man’s side, chirping for Mrs. Rufous to “Buzz off!”. Mr. Black-chinned seems to know he’ll soon be catching it from the Mrs., while Mr. Rufous has seen it all before and goes back to slurping. Meanwhile, although very much aware of how the brazen Mrs. Rufous is showing off for Mr. Black-chinned, Mrs. Black-chinned decides to finish her breakfast before taking action. 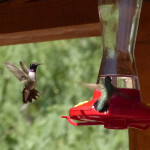 The most common, and average-sized, hummingbird at the Casitas is the Black-chinned Hummingbird, which has an average weight of about 0.15 oz. Considering the research of Hainsworth and Wolf, if each of these hummingbirds consumed, say, just 6.5 times its body weight (or about 1.0 ounces of Casita sugar water nectar) a day, that would equate to about 0.1 cups per day (1 cup sugar water nectar weights 10.6 oz.). Doing the math, the 85 gallons of sugar water nectar that will be consumed at the Casitas this year amounts to approximately 13,600 hummingbird meals fed over the approximately 200-day season, for an average of 68 bird-meals a day. The actual number of birds present at any given time varies greatly during the season. Starting out with only a few in March, their numbers gradually increase as the Summer progresses, until reaching a peak in August, when the greatest diversity and number of wildflowers are blooming along Bear Creek. 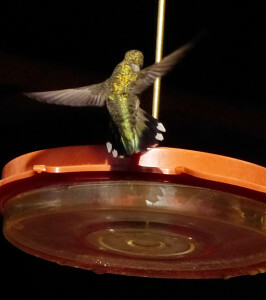 At this time, the feeders at the Casitas are literally swarming with the little birds from dawn to dusk. If one takes the time to read and study the facts about the life history of hummingbirds, one quickly comes to understand that they are truly amazing little birds. Hummingbirds are the smallest birds in the world, and have the highest metabolism of all animals, with a resting heart rate of around 450 beats per minute which can increase to in excess of 1,000 beats per minute when flying, and a resting breathing rate of 245 breaths per minute. In terms of flight, they can hover, fly upside down, sideways, or backwards and forwards, with forward speeds of 25 to 30 miles an hour, and top speeds of 60 miles an hour in dives, with wings beating from 70 to 200 times per second. 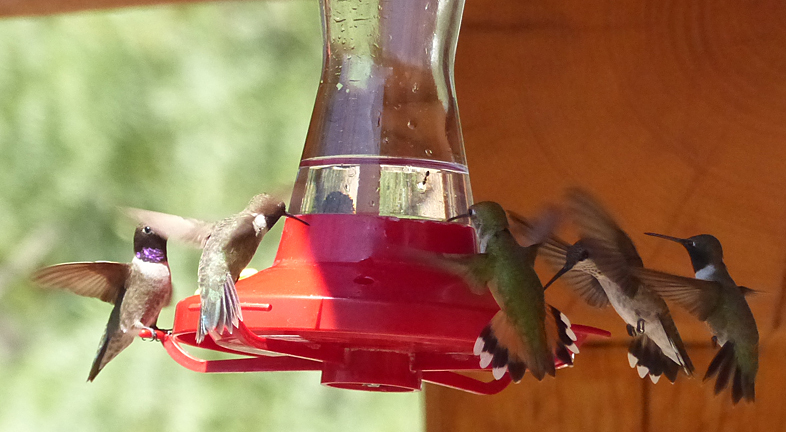 They are voracious feeders. The Black-chinned Hummingbird, for example, slurps nectar along two grooves in its tongue at a rate of 13-17 licks per second. Several species migrate very long distances, with most species wintering in Southern Mexico. The Rufous Hummingbird, for example, takes one of the longest migratory journeys of any bird in the world, covering 3,900 miles (one-way) from Mexico to Alaska and return in one season! Later in the day, after the Black-chinned and the Rufous group has had their fill and left, a lone female Calliope Hummingbird is seen coming to the feeder for a long quiet slurp, all to herself … Calliope Hummingbirds are the second smallest hummingbird and are the smallest breeding bird in the U.S.
Research on Rufous Hummingbirds has shown that hummingbirds possess elements of episodic-like memory, namely the concepts of where and when. Apparently, this memory enables them to remember not only where every feeder or flower is and when it will be refilled with nectar on a local basis, but also functions equally well for the entire migration route and from one year to the next. 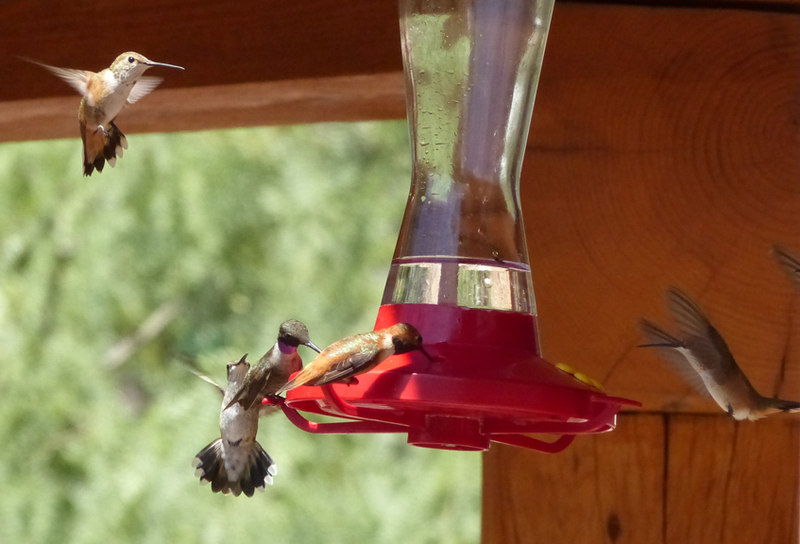 Our experience here at the Casitas also seems to agree with the reported claim that they quickly learn who fills the feeders and who doesn’t! The average life span of hummingbirds is 5 years, however life spans of 10 years are documented for some species, such as the Black-chinned. 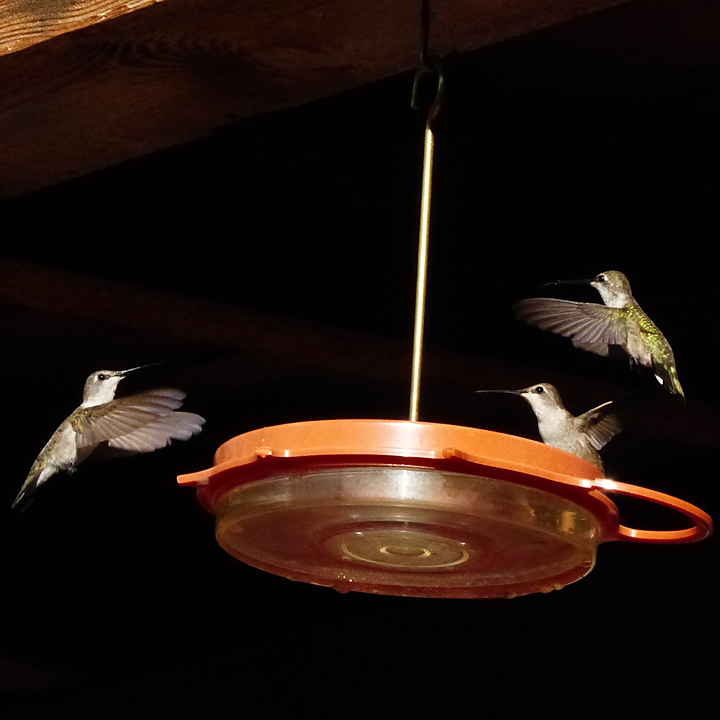 Thus, it is likely that many of the hummingbirds visiting Casitas de Gila Guesthouses are repeat visitors and have been coming here for several generations. 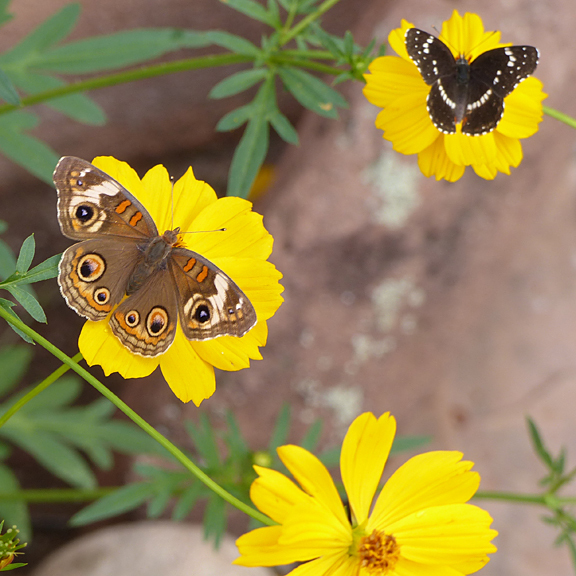 Two members of the Brush-foot Family (Nymphalidae), a Common Buckeye (Junonia coenia) and a Bordered Patch (Chlosyne lacinia), enjoy the nectar of the Coreopsis flowers planted in the courtyard at the Casita Office. In August, about a month into the Monsoon Season, wildflowers peak both in number and diversity throughout the riverine forest that borders Bear Creek, 100 feet below Casitas de Gila Guesthouses. Accompanying the hummingbirds that gather to exploit this annual profusion of colorful blooms and fragrance are the Butterflies, flitting from flower to flower in silent, graceful counterpoint to the noisy, chaotic darting to and fro of their avian competitors. It is estimated that there are about 20,000 species of butterflies in the world, with about 725 species reported from North America north of Mexico, of which about 575 species are found in the lower 48 states of the United States. 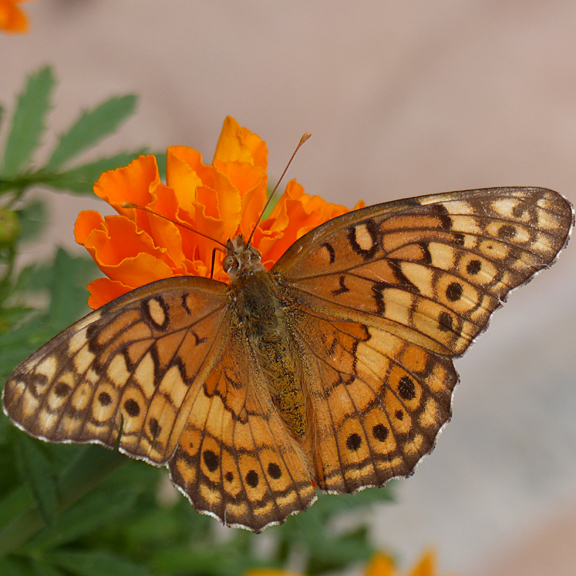 Approximately 300 species of Butterflies (Class: Insecta; Order: Lepidoptera) are reported from New Mexico, representing one of the most diverse Butterfly faunas in the United States. This faunal diversity is due to the great geographic diversity of the immense New Mexico landscape which includes portions of the Great Plains, the Southern Rocky Mountains, the Basin and Range, the Colorado Plateau, the Sonoran and Chihuahuan Deserts and the Sierra Madre, with elevations ranging from 2,970 feet in the southern deserts to 13,039 feet in the northern mountains. 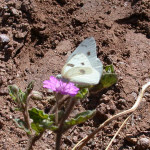 About 100 species are known from Grant County where the Bear Creek Nature Preserve and Casitas de Gila are located. 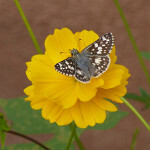 Unidentified species of Skipper Family (Erynnis sp.?) 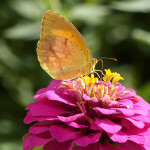 (Hesperiidae) on Marigold flower in the Casita Office courtyard. 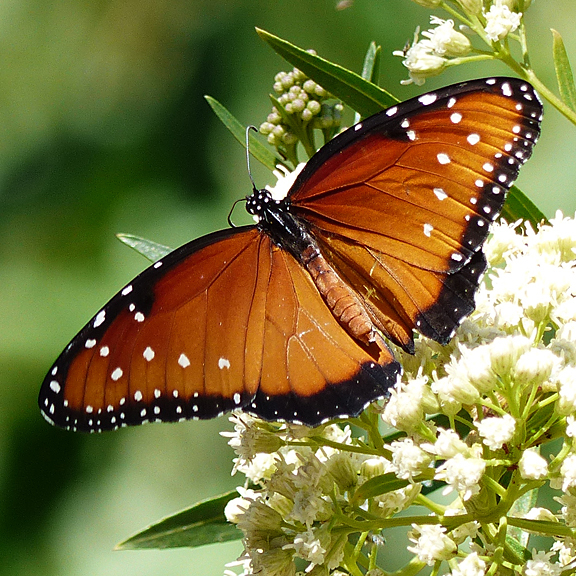 A Queen Butterfly (Danaus gilippus), Brush-footed Family, forages on a Seep Willlow flower (Baccharis salicifolia) below the Casitas on Bear Creek. The Queen Butterfly is in the same Genus as the famed Monarch (Danaus plexippus), but does not make the legendary migration to Mexico that the Monarch makes. Over the years, numerous species of butterflies have been observed at Casitas de Gila, both those feeding on the wildflowers along Bear Creek, as well as species attracted to the native plants and non-native flowering plants brought in for landscaping around the Casitas. In the Spring of 2014 an extensive planting of various traditional garden flowers was undertaken in the courtyard at the Casita Office. 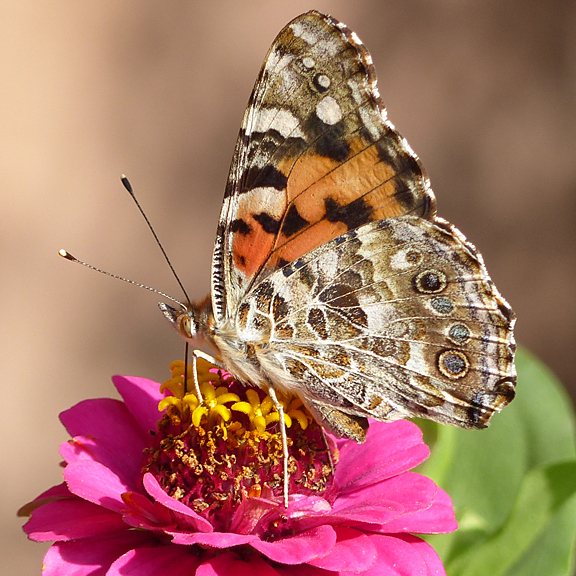 Beginning in late July and peaking in early August, a large variety of butterflies were swarming the courtyard flowers daily. 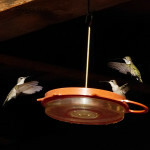 It was a spectacular sight, delighting both the Casita hosts as well as incoming guests. Then, by the middle of August, although the flowers were still at the height of their blooming, the number and variety of butterflies suddenly plummeted as a series of cold nights occurred following evening thunderstorms. 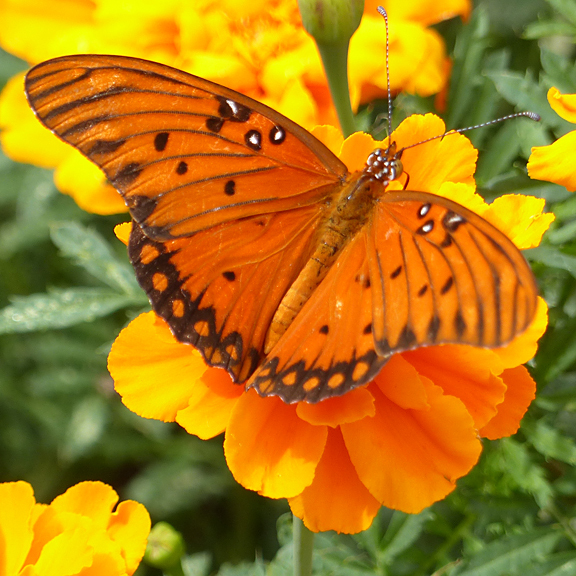 Within a matter of a couple of days, the spectacular butterfly pageant was over, only to be replaced, to the head gardener’s horror, by a vast horde of thousands of tiny, half-inch grasshoppers that immediately set upon devouring every flowering plant in sight. 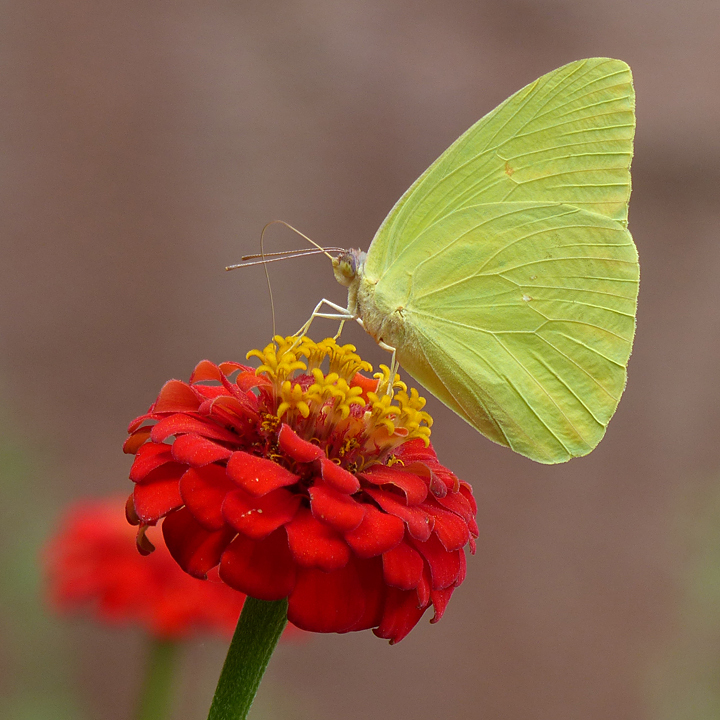 A Sleepy Orange (Eurema nicippe), Whites and Sulphurs Family (Pieridae), slurps nectar from a Zinnia in the Casita Office courtyard. 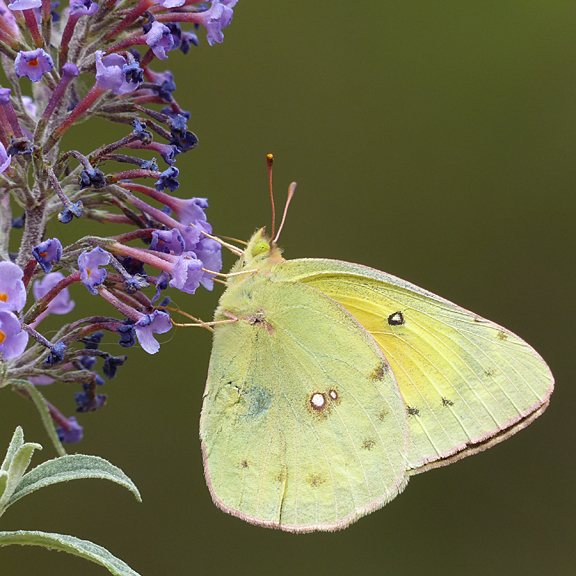 A Southern Dogface (Zerene cesonia), Whites and Sulphurs Family, drains the nectar from a Butterfly Bush flower in the Casita Office courtyard. The diversity and abundance of flowers along Bear Creek and adjacent lands varies significantly from year to year. The dominant controlling factor, of course, is precipitation—when and how much. After 15 years of observation, here at the Casitas about all that is certain is that no 2 years are alike in terms of when, where, and how much rain will fall during the Summer Monsoons along the Bear Creek drainage system, and, consequently, whether a particular flower species will be abundant or not. 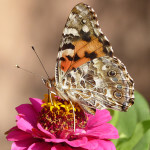 Not surprisingly, the butterfly species, both in terms of diversity and abundance, also show similar variation and unpredictability from year to year. Temperature variations are much less a factor than precipitation in affecting diversity and abundance of various species, but in some years, such as this year, it can be significant. 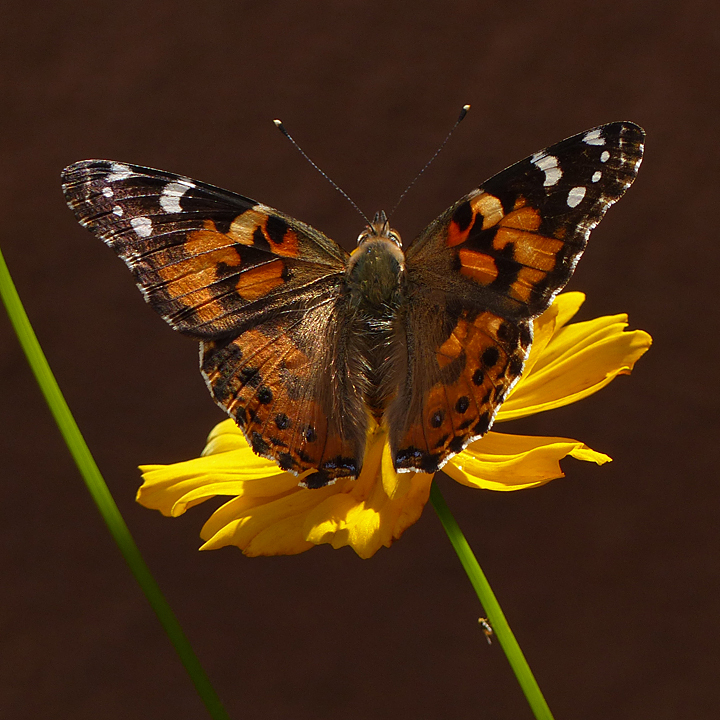 The Summer of 2013, was a bountiful year for both wildflowers and butterflies. The Monsoon rains started right on schedule with a major hail and rain thunderstorm on July 2, and continued into the third week of September, triggering 7 major flash floods along Bear Creek, with extensive flooding across the entire floodplain lasting up to several hours and running several feet deep. Temperatures were normally warm throughout the period especially during August, the peak month for flowering. Summer 2014 has been a different story, however. Overall, temperatures have been cooler, especially during August, which has seen more cloud cover, and atypical slow drizzling rains of minor accumulation instead of the more typical heavy downpours resulting from intense, but short-lived thunderstorms. Many nights have been exceptionally cool, in the high 50s F, as evidenced by numerous cottonwoods showing extensive premature yellowing of the leaves. Also, very little rain has fallen during the second half of the month. A similar weather pattern has existed during the month throughout the 25 mile-long Bear Creek drainage basin as evidenced by the fact that the Creek has not yet experienced a single major flash flood this year. The stock fences across the Creek at the north and south ends of the Casita property, which are normally washed away several times each summer, are still standing, having been put up at the end of the Monsoon Season last year. By the middle of August, flowers along the Creek were still not blooming in abundance and many plants were starting to wither. 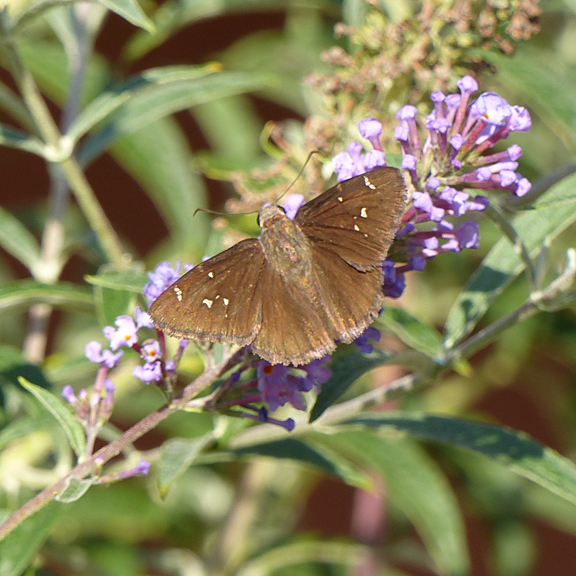 As observed in the Office courtyard, butterfly diversity and abundance along the Creek peaked in early August and dropped off markedly after the middle of the month, with only a few species and numbers remaining. All in all it has been an unusual Summer, well illustrating the amazing Cycles of Natural Change that occur in this High Desert landscape. 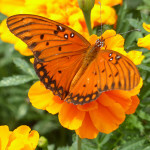 This entry was posted in Butterflies, hummingbirds, nature, nature preserve and tagged butterflies, hummingbirds. Bookmark the permalink.